I have MANY problems with my skin. It is too dry. It is really sensitive. My skin has a lot of redness. When my skin isn’t looking or feeling it’s best, I don’t feel my best. I have found amazing products that make my skin look amazing and feel amazing, therefore.. I feel amazing. I want to share with you my skin problems, what I use to combat them and my skincare routine. I have very very sensitive skin, which sometimes can be very annoying because it means that it is harder for me to experiment with skincare products. If I use a product that is an own branded product, so for example a toner or facial wash by Wilkinsons or Boots it will more than likely sting my face and turn my face red. I try to stay clear of these types of products because It probably won’t work for me. I also find that I am allergic to any products that mainly contain aloe vera, so any aloe vera face wipes or face washes I am allergic to. Lastly, because my face is very sensitive, it also means that my face has a bit of a redness to it. The redness flares up at different times so if I am hot, if I wash my face or put product on it, if I am exercising, when I first wake up etc.. I do believe that these are Superdrug’s own brand, and I am shocked that they work. But they are VERY GOOD. These are the first products that are own branded that i have found to work. I use these because the camomile really calms down my redness and my whole face in general. It balances out the uneven skin tones on my face and I have found them to work amazingly well with regards to redness. They both target the same areas. calm skin relaxing overnight mask – I use this before I go to bed and wash off in the morning. calm skin soothing facial cleanser – I use this when I wash my face and will rub all over my face then take it off after. Using products with camomile in is very good as it helps calm stressed skin, meaning that it won’t be red and irritated. Always test products before buying them, you don’t want to spend your money on a new moisturiser if your skin is too sensitive for it. This is something that I deal with on a daily basis, more so in the winter. I get VERY VERY bad dry skin. To the point where, when I went on holiday my skin was flakey and crusty. VERY BAD. This is something that I am self-conscious about, however, I have found amazing products that work like a dream and make me feel confident about my skin. Every single night before I go to bed I will moisturise my face, because without realising it, your face does need to be hydrated. In the winter I will moisturise my whole body when i get out of the bath or shower. I also get very dry lips so I must have a lip balm with me all the time. Even after wearing a liquid lipstick for one day, I will need a lot of lip balm after. Clinique moisture surge & Aveeno skin relief. These products are incredible! I know they are very popular and well-known when it comes to moisturising the skin. Clinique Moisture Surge – it has a thin gel consistency, but grabs on to each bit of dryness and moisturises it. 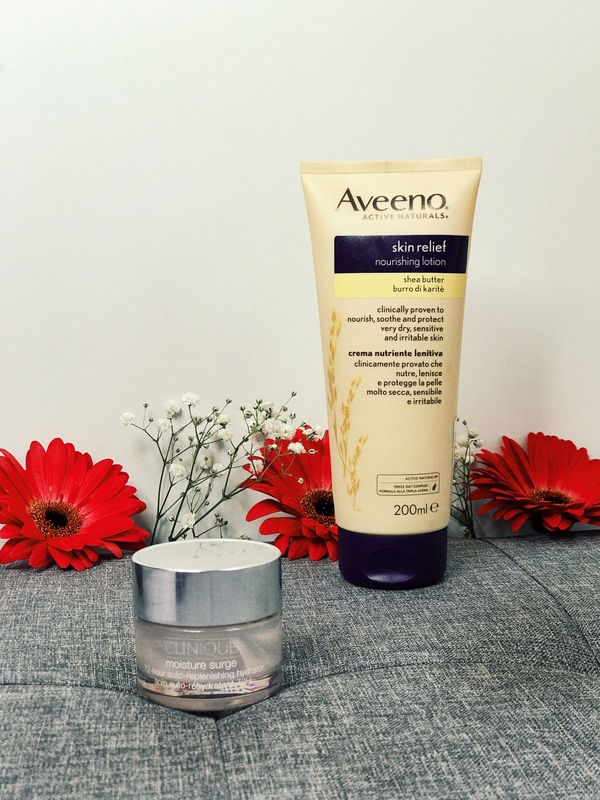 Aveeno Skin Relief – is a very thick moisturiser, perfect for winter. It is an oat based product that really helps to moisturise skin. Kiehls Midnight Recovery – is an oil that is definitely needed when it comes to dry skin. It soaks up the dryness and gives my skin a good moisturise in a way that moisturiser can’t. 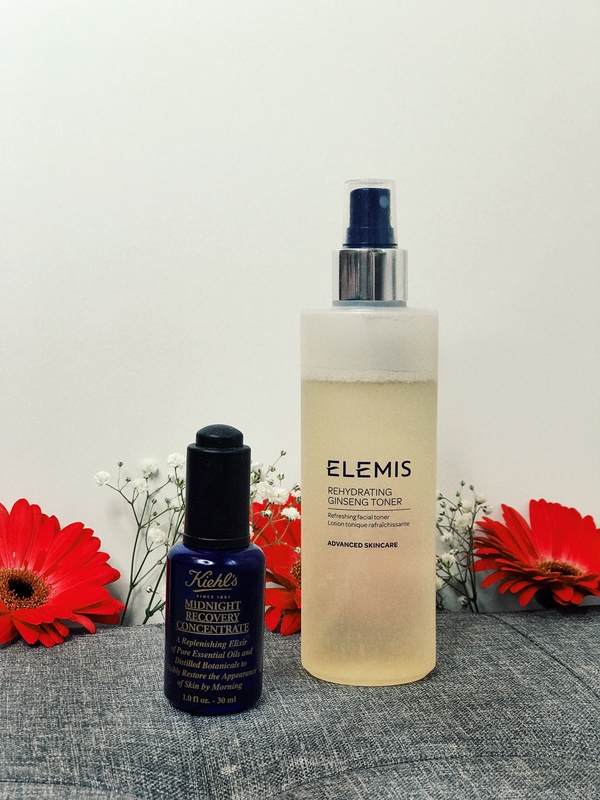 Elemis Ginseng Toner – it is a toner, it not only removes excess dirt from your face but moisturises aswell. Moisturise in the morning and the evening. Find a foundation that doesn’t cling onto your dryness and is moisturising. When you wash your face, I tend to use a face cloth. Wash it with hot water and finish using cold water. The hot water will open up your pores and the cold water will close them. Not only will this get dirt out from your pores, but finishing using the cold water is good because hot water will make your skin dry. Heat will make your skin dry, this includesoati any steam rooms, being around fires or having hot showers. Use face masks specifically for dryness. I recommend Oatifix from Lush! DONT FORGET to moisturise your lips. Use a bath milk or bath oil to moisturise your whole body. I will take my makeup off and then use the soothing facial moisturiser. Then I will use my Elemis rehydrating ginseng toner. I spray the toner all over my face, then wipe it off using a cotton pad. This gets off any excess makeup and also moisturises my face. Then I will use the Clinique moisture surge and then apply the Aveeno on top of that, depending on how dry my skin is. I will normally do this in the winter. On a day to day basis if my dry skin isn’t that bad, then I will just use the Clinique one. Lastly, I will use the calm skin overnight mask to finish everything off and then in the morning i will wash my face. What are your skin problems? what products do you use to help? Any undiscovered tips for healthy skin? 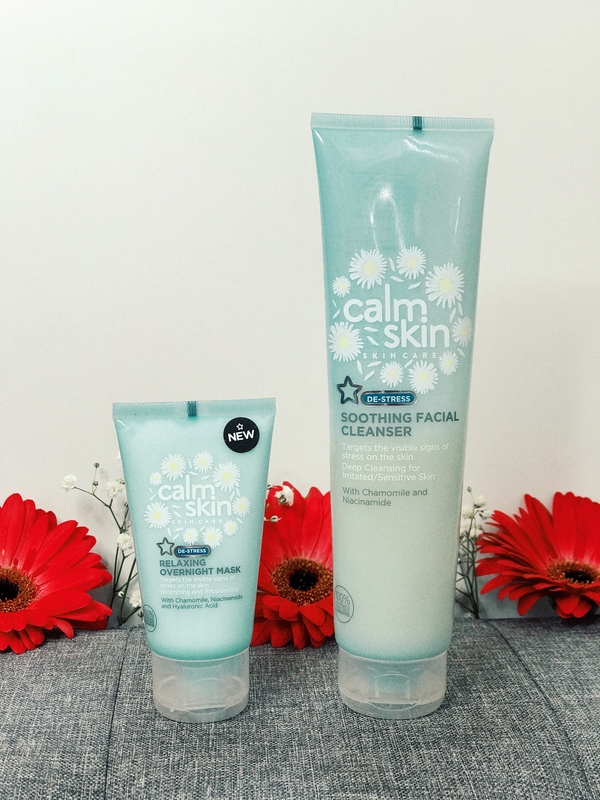 Didn’t know camomile could combat redness – differently need to try that out! I have a dry skin and drinking a lot of water helped making it a little bit more healthier,I’m currently using just natural products like rose water as a toner and morrocan oil as a moistrizer,I’m trying to avoid the chimicals as much as I can! but it’s not the most practical thing ever,so I’m looking for products with more natural ingredients. Thank you. I’m glad I could have helped you. Literally same here, I hate it sometimes. Yes give it a try, it changed my life. Erm, I have used yesto cucumbers and also the anatomicals calming algae face mask. There might also be one from lush too. just have to have a look around!